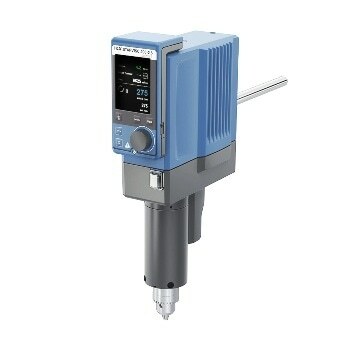 Measure and display viscosity during product development with the new IKA STARVISC 200-2.5 control torque-measuring stirrer. With the ability to read the result in real-time on the display, the STARVISC has a wide range of applications. During product development this is particularly useful, and the STARVISC already indicates whether a stirred substance can be used as required. Using STARVISC, samples can be measured with high precision, even during the manufacturing process. As well as this, samples no longer have to be taken separately. Using a user-friendly menu, viscosity can be immediately, and easily calculated. The STARVISC can be controlled from a safe distance using the modern, removable TFT display. The STARVISC stirrer is powerful, allowing even highly viscous substances to be intensively stirred.